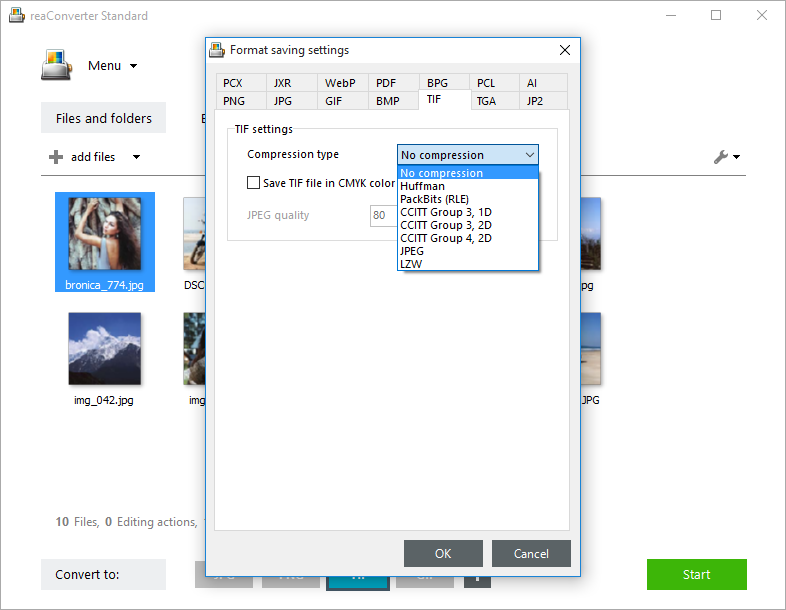 reaConverter's latest edition offers a set of effective features if you plan to add compression to your images while converting them to the TIF format. For example, if you want to prepare an image for faxing or simply convert it to a bitonal format, you can pick one of the CCITT group types of compression, which is commonly used for fax transmissions and document imaging. The name comes from the International Telegraph and Telephone Consultative Committee — an organization which established several transmission protocols. Adding a Group 3 or Group 4 CCITT compression will turn images into black-and-white. LZW is another popular type of compression, especially when you convert files processed in advanced graphics editing programs. The greatest advantage of this compression is that it is "lossless", so it preserves the quality of the original image. Huffman and PackBits are 2 additional "lossless" compression types supported by reaConverter, along with the more popular JPEG compression. Load one or more images you intend to convert. Add them using the drag-and-drop tool or by selecting them manually from a local folder. 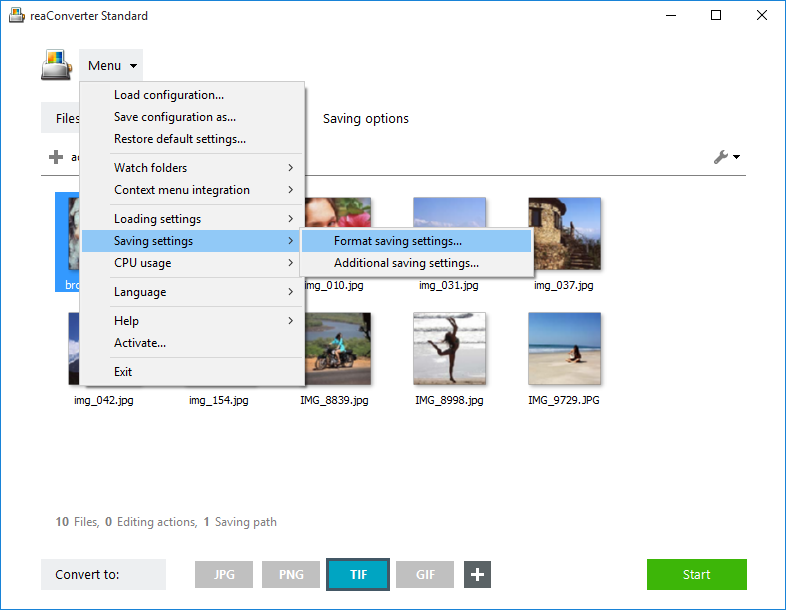 Go to Menu → Saving settings → Format saving settings and find the TIF tab. Here you will be able to add the desired type of compression from the dropdown menu, available options including CCITT, Huffman, LZW and more. An additional option allows you to save TIF files in the CMYK color space. Go to Saving options and pick a location for your converted images. Save them locally or in your storage cloud. Finally, pick the TIF extension for your output files by clicking the corresponding button from the lower part of the window. 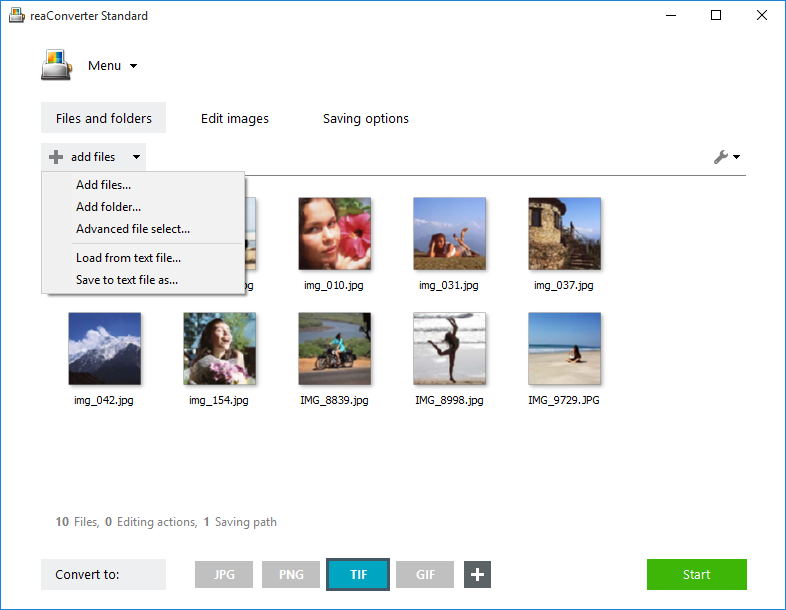 Then simply press Start and soon enjoy your newly converted and compressed images!